There is a fundamental flaw in the thought that understanding the anatomy of the visual system will help us understand how visual perception occurs. Recently I studied a visual perception course presented by Dr. Dale Purves, M.D. through Duke University hosted on Coursera and learnt for the first time that visual perception does not match physical reality of objects we see in the real world. The reason I took the course is because I thought I might learn more about how treatments such as mirror therapy work for treatment of chronic pain and I expected to deepen my understanding of the clinical anatomy and function of the visual brain. I would have never anticipated to learn so much about the extent to which visual illusions exist in our everyday sight, and how many discrepancies exist between what we see and the physical reality of what we are looking at. The first part of this blog shares some of these illusions & learnings from the course, and the second part looks at the construct of graded motor imagery as a treatment paradigm. The first example is the Ponzo illusion (seen in the image below), which is one of many visual illusions that assist in our ability to understand geometry and gain linear perspective. 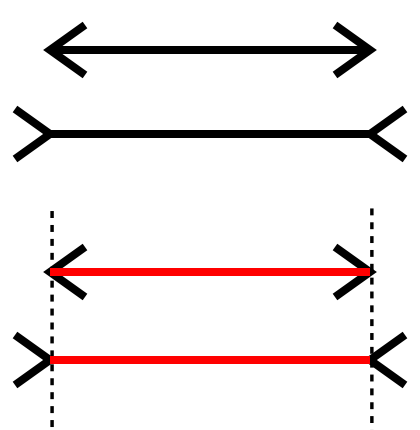 The Ponzo illusion is most commonly demonstrated by placing two identical horizontal lines between two oblique lines which are converging towards a central line in the horizon. 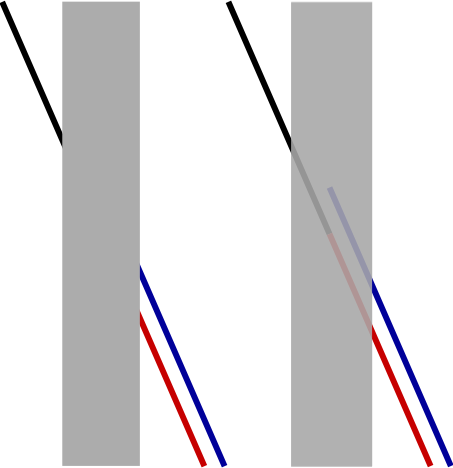 Although the lines are physically identical, to the many people, the bottom line will appear to be smaller. In this illusion the entrance and exit points of the oblique line look different, when in fact they are on the same angle. This image uses colour to help us decipher the illusion. In the Mueller-lyer effect the inner lines are identical in length and visually look different. The arrow heads trick us into seeing the top line as shorter. In the real world we see this example most easily when we look at the corners of rooms. Architects can change the perception of space by having corners facing in or out. This is an example of a geometrical illusion and there are many of these scattered throughout the real world we see every day. The Ebbinghaus effect is an example of perception of object size. When you compare the size of the inner circle in it’s surrounding context most people will see the right circle as being larger. Although they are physically the same we perceive them as different size. So our perception of size, geometry and colour are all an outcome of context. Now you might be wondering why I am talking about all these illusion? Well, apart from this being fascinating new knowledge which I wanted to share with you, I was immediately reminded of a treatment we are using more and more for chronic pain - Graded Motor Imagery (GMI). I suddenly realised that GMI does something particularly interesting - it uses the visual brain to reprogram essentially how we think about movement without activating pain neurotags. Although GMI is not all about illusions (although the mirror therapy is) it harnesses the connection between the parts of the brain used for vision and movement. While we are still learning about the brain and it's functional areas, it is amazing to see that treatments such as this exist. Following the completion of my online course I decided to re-read the book by Moseley, Butler, Beams and Giles called ‘The graded motor imagery handbook’ from the perspective of the role of vision in this approach. Colours are not properties of objects. In fact, the qualities we call colours are generated by the visual brain and there is no one-to-one relationship between colours seen and wavelengths of light. For example, in this image below the centre colour is physically identical but what we see is different. Colour is a product of context. And essentially pain is a product of context and pain management is reliant on context too. It was Thomas Young who made this discovery, that vision colour is an outcome of comparison and that there are different cells in the retina known as rods and cones which are specialised for different wavelengths of light and amounts of luminance. We see colour in our central vision in an area of the retina known as the fova. In the fova there is a large density of photoreceptors comprised completely of cone cells. What this means is that our central vision is specialised to see colour, not our peripheral vision. In the context of motor imagery then, we should aim to keep the object of focus in the centre of our vision and be aware that context, contrast and background will impact the image that the visual brain detects. Why do we have colour vision? Not all animals do and biologically speaking we aren't able to claim that it is essential to survival. For humans colour vision allows us to distinguish between different objects of equi-luminency i.e. to see two different objects that lie on the same point of the greyscale. There are 4 pure colours that we see: blue, yellow, green and red. The remaining colours in our vision migrate towards one of these four colours. The example above helps us understand the strange way we see colour and there are two opposing terms: colour contrast and colour constancy. Colour Constancy occurs when two physically different objects are seen as identical and colour contrast is when physically identical objects are seen as been different. The example above represents colour contrast and is again demonstrating that physical reality and visual perception can often be very different. So why might I be interested in understanding colour vision? If we come back to GMI the degree of difficulty is impacted by context and colour. The basic images in the Recognise app are termed vanilla and essentially provide a colour image that is very similar to black and white, allowing the visual brain to clearly differentiate the central target from the plain background. My understanding of the purpose of this, is to provide a distinct stimulus to the visual brain allowing for easy and rapid processing and encouraging the brain to make the unconscious decision about left/right discrimination. In essence it appears that when we are using the visual system to access the motor cortex without activating pain neuortags and to have the desired outcome of accuracy and speed, we need to make the task as easy as possible. As the application progresses, images become more complex in orientation, more abstract in design and more complicated in context, which in turn requires more in-depth processing from layers within the visual cortex. Distance refers to the sense of how far away something is and we see distance equally with both eyes. This is called monocular vision. Depth refers to a special sense of 3D called stereopsis and is mediated binocularly. This was my favourite learning tip from the course - that we need both eyes to see depth and to judge it correctly. Here is a great learning example. Take two pens and hold them out in front of you. Then touch the two pen tips together. My guess is that most of you will have no difficultly touching the tips accurately. Now close one eye and repeat. This is an example that confirms stereoscopic depth i.e. vision of depth comes from using two eyes. My guess is that you can’t touch them together. After completing this test my mind was automatically drawn to falls prevention - how are people meant to judge depth in the environment around us if they don’t have binocular vision? So all these examples show that what we see is different from physical reality. So for our vision to be reliable and accurate we need to have successful cumulative experience from our interaction with the real world. Again coming back to GMI - the authors from NOI group emphasis that implicit motor imagery needs to be about speed, accuracy and success. This is a key take home message from the book on GMI - that patients need to successful complete the phases of motor imagery without aggravation of their pain to achieve a successful grade exposure to movement and motor imagery. All of these examples are explained in detail in the course I took and I would highly recommend treating yourself to 5 weeks of new knowledge on vision and the brain. What I am trying to demonstrate are some of the unexpected things I learnt and also express that the course exposed me to realising how incomplete my knowledge is of how the brain processes visual stimuli. Once I realised that I don't thoroughly understand how the visual brain works, I also realised I might not understand the mechanisms and reasoning behind graded motor imager and mirror box therapy? It is not simply enough to know that the treatments exist for the management of chronic pain conditions. We have to understand them and pass this knowledge onto our patients. How do the 2 views from the left and right eye get put together? Both eyes send images to the thalamus and at the level of the thalamus (lateral geniculate nucleus specifically) the information from the left and right eye is kept apart. 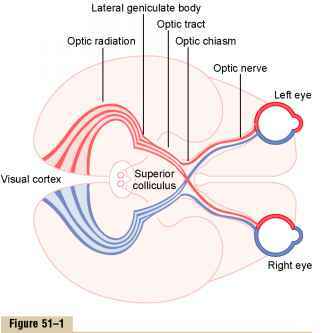 There are 4 layers within the lateral geniculate nucleus that help process information for each eye simultaneously or independently. Layer 4 has left and right views. Layers 1,2,3 and 5,6 are all mixed. I’m not sure I completely understand the functional anatomy of the visual pathway or how the visual brain processes what we see, but I have definitely got a deeper appreciation for the complexity of our remarkable brains. I am also curious to understand how light reflecting onto the retina, projecting an image to the visual cortex for processing, can then link back to the sensorimotor pathways and accurately retrain our perception of movement without activation of pain neurotags. 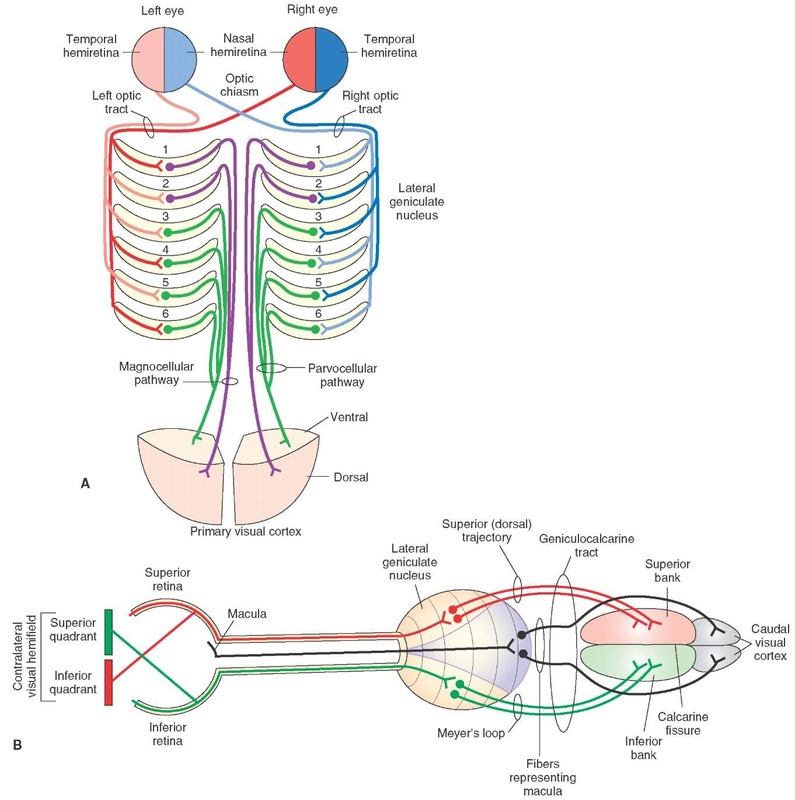 I also appreciate now how pivotal the thalamus is as a relay centre for all stimulus processing entering the body. Something I learnt about the visual system is that it plays a vital role in feature detection. We use our eyes to measure features of the world, send information to the brain for processing and that how we interpret these messages corresponds with physical reality. This feature detection is a vital part of successfully responding to GMI I suspect. I also learnt how important our personal experience is in influencing what we see and how we interpret that. What you see when you look at the images of hands and feet might be, and mostly likely will be, interpretably differently to the patient you are working with. We need to appreciate that there is no way of always predicting what the outcome will be and therefore we should attempt to start at the most reasonably safe part of the program, which is left and right discrimination. Vision plays an important role in coding of information from the external environment. You would all agree that when learning how to observe gait or scapula mechanics the task begins as a laboursome and a difficult interpretation of observation. Over time we learn to process what we see far more quickly and interpret these movements based on other known features of our patient’s problem. In fact, we learn to code and compress large amounts of information into single ideas. It is important to remember that this coding occurs in all aspects of vision and in the case of chronic pain, where we know that coding of information is often imprecise and leads to inaccurate activation of pain neurotags, that using the visual system as a tool for recoding can be very powerful. Our brains are not computers and we all see the world in a slightly different and peculiar way. We interpret the world based on our knowledge and experience and our interpretation is reinforced through repetition. It is so easy to completely overlook that GMI is grounded in activation of the visual system as a means of accessing non-pain neurotags associated with movement. How we see the world is totally subjective, how we respond to GMI will be unique as well so be careful not to inject your interpretation into someone else. Visual accuracy is a matter of trial and error and this brings me to the mantra of NOI group - patients, practice, commitment and courage. For GMI to be a successful treatment as a part of managing chronic pain we need to be mindful of the time and perseverance needed for the journey ahead. Moseley, G. L., Butler, D. S., Beames, T. B., Giles, T. J. (2012). The graded motor imagery handbook. Noigroup publications.